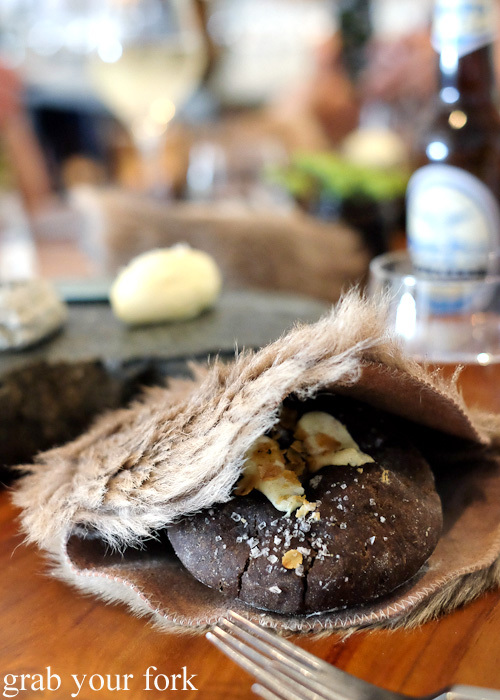 A kangaroo skin is the last thing you'd expect to find keeping your bread roll warm, but Biota Dining isn't like most other restaurants. 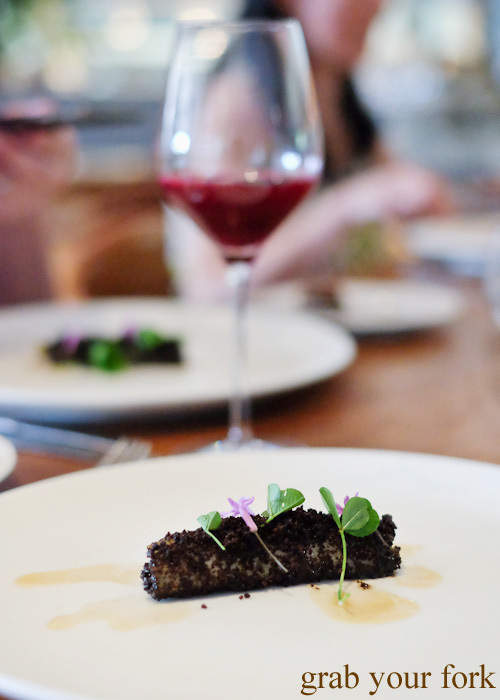 The majority of the produce on the menu is grown in their own kitchen garden or sourced from local suppliers around Bowral. Last year they redesigned their wine list to a completely Australian offering. 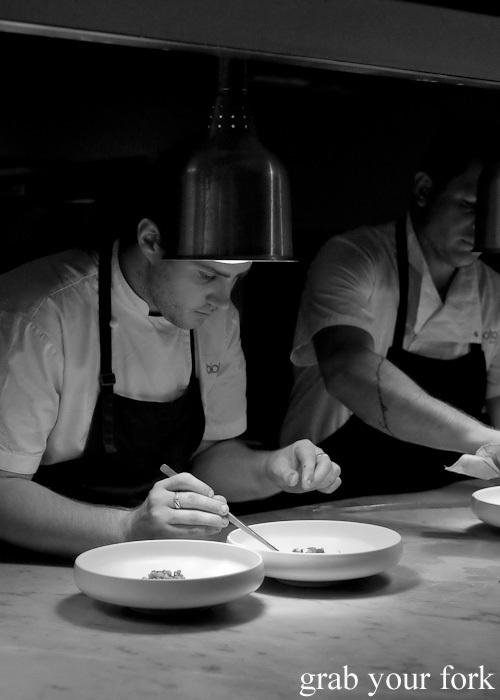 In the 2015 SMH Good Food Guide Awards, Biota maintained its two-hat status and took out Regional Restaurant of the Year for the second year running. It's only a seventy minute drive to Bowral but this city of 12,000 feels a world away from Sydney. We trawl the main street - the delightfully named Bong Bong Street - before lunch, pottering around antique stores, the ubiquitous town lolly shop and sneaking in an award-winning Funky Vanilla Slice from Gumnut Patisserie. Their pies are particularly good too - the steak and kidney pie is my favourite. The sense of a slower pace continues at Biota, a small standalone estate with its own circular car park and lofty hedge by the entrance. To the right are twelve accommodation rooms; to the left is the main dining room with a bar area that is taken up today by a wedding celebration. There's a distinct Nordic touch to the furnishings here with its wide and low-set wooden chairs, bare branches and naked bulbs that look like they're hanging from the end of a vine. The dining room is only a third full today so the noise level is quiet. It's a mixed crowd - mostly couples and small groups of friends. The absence of music is said to be a deliberate touch, to allow diners to focus solely on their meal. There are only two choices for lunch or dinner. 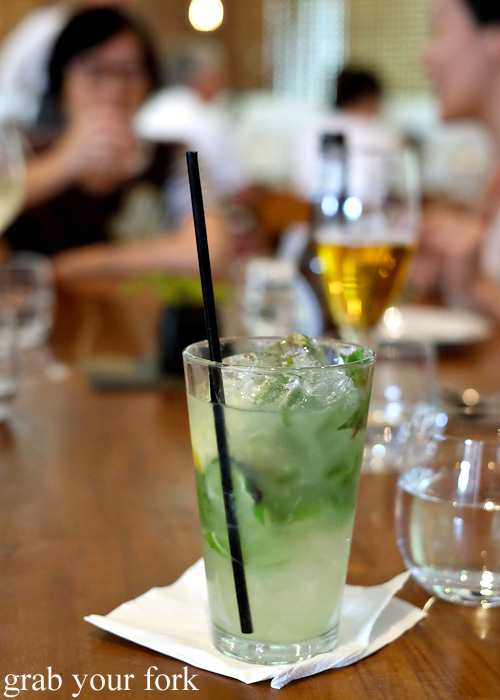 The summer menu is available as either a nine-course or six-course affair. We're surprised there is no overlap between the two. After much discussion, we end up choosing the longer offering. The entire table must choose the same option. Complimentary snacks immediately set the tone of our meal. 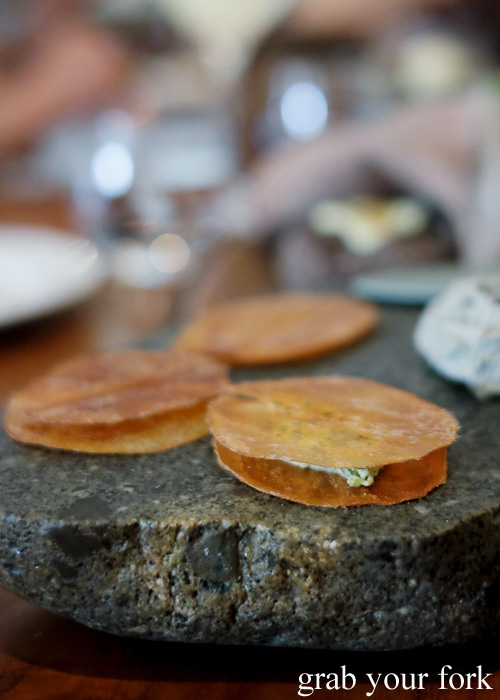 It's hard not to admire the dramatic entrance of the heavy stone plate set down at our table, alongside a kangaroo pouch of bread. Sweet potato crisps are sandwiched with a creamed oyster filling, the sweet and delicate snap of the sweet potatoes contrasting with the salty tang of oyster. The rye bread is still warm inside the kangaroo skin pouch, baked with smears of yoghurt on top and sprinkled generously with salt. There's a strange reconnection with food and where it comes from as we stroke the soft fur of the kangaroo. I'm not sure whether they deliver the poach to vegetarians, but as a carnivore, it's a reminder of the reality of the origin of our food. 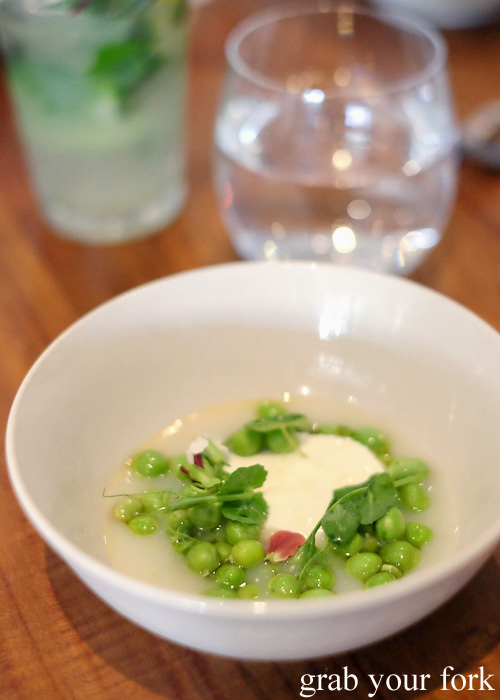 Our first course, raw peas and fresh cheese, involves more tableside theatrics as a beaker of oyster milk is poured gently into each person's bowl. Freshly podded peas are a whole different experience to the usual frozen variety. Eaten raw, they have a slightly starchier consistency, with less sweetness but more "pea" flavour. It's a light start to the meal, the fresh cheese adding a light creaminess. 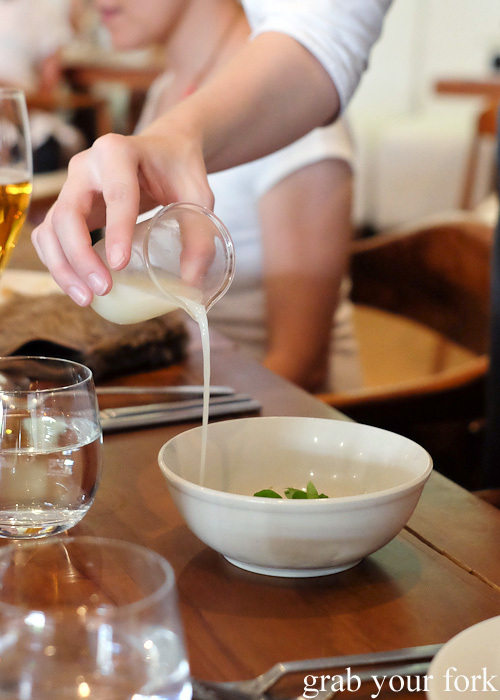 The oyster milk gives a briny sweetness. Pig Flyin' has gone for the juice matching but ends up sharing most of it with the rest of us anyway. 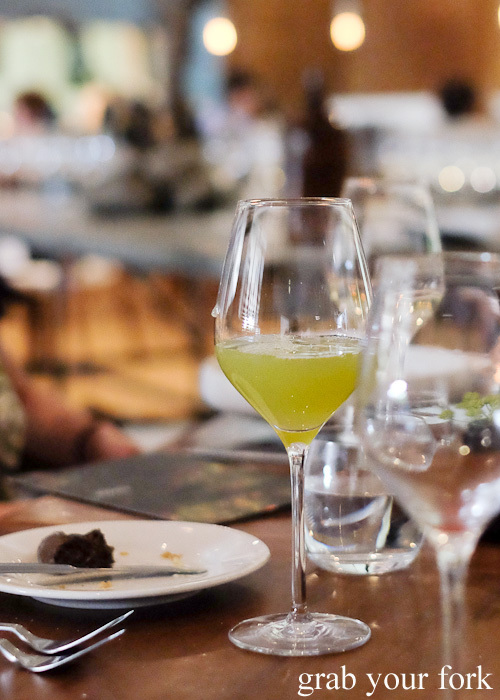 We're all quite intrigued by what will be included with the juice matching after experiencing Mr and Mrs Pig Flyin's juice matching at our Stomachs Eleven Christmas dinner. 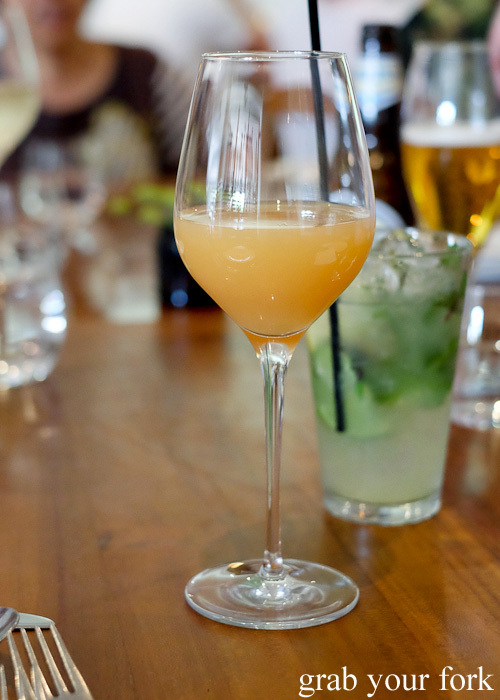 The charred and caramelised grapefruit juice has a marked intensity about it. We don't really get a sense of charred fruit, but the palm sugar balances out the bitterness nicely. 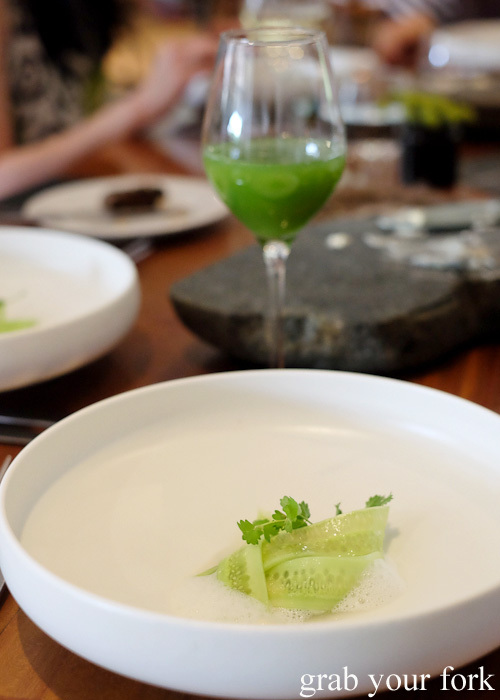 Our second course of salted cucumber, oysters and beach plants involves more tableside attention as spoonfuls of oyster foam are gently placed on each pate. 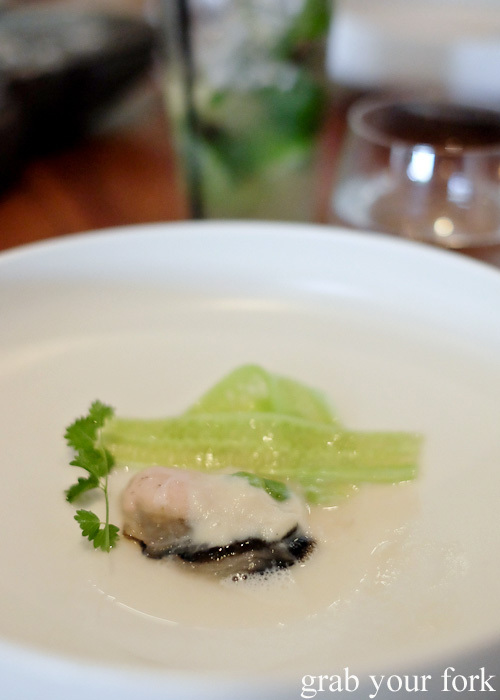 Hidden behind the curtain of cucumber is a plump South Coast oyster. It's impressively fat and juicy, singing with fresh brine. 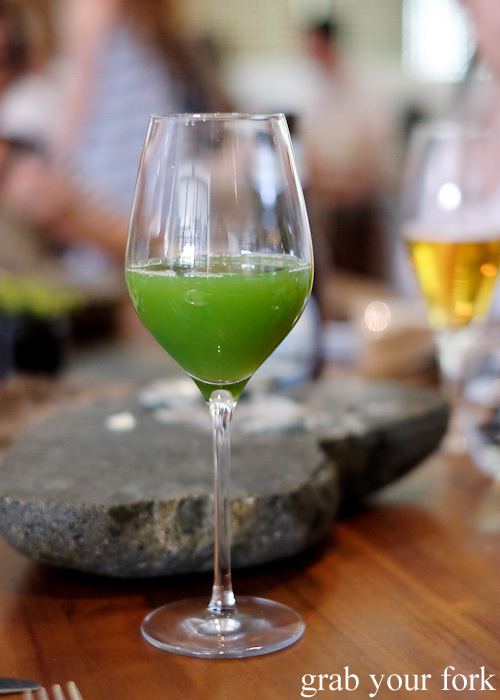 The cucumber is mirrored in the matched juice, a bright green cucumber juice with tea and a faint infusion of rose petals. 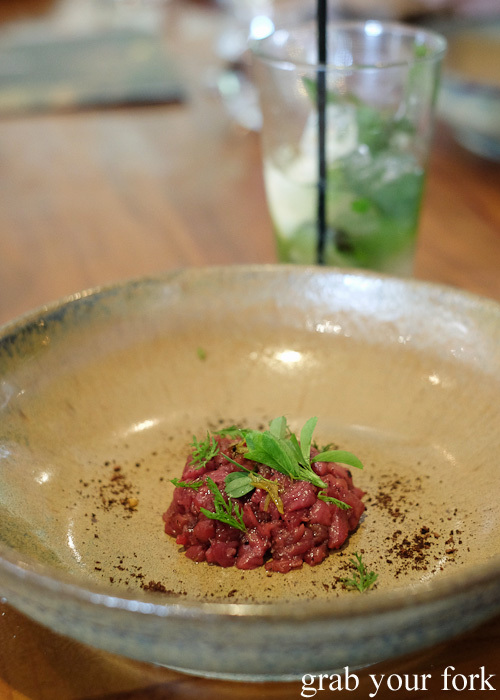 We move onto a tartare of kangaroo. The hand chopped meat is firm and luscious, and not overly gamey in flavour. Buried in the middle is a huddle of what tastes like creme fraiche. The silky meat is accented by pops of deep fried buckwheat and micro herbs across the top. Sundried red grape juice adds a bright acidity to this dish. We're told that bunches of red grapes are sundried, pressed whole and then the skins are added back into the juice for steeping. The standout dish of our meal belongs to the smoked hen, creamed corn and sprouted grains. There's an sharp intake of breath as we discover the first mouthful, the poultry so soft and succulent it almost defies belief. 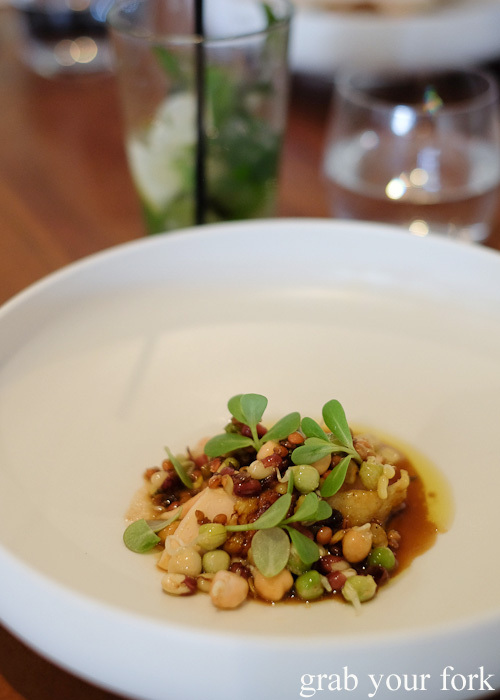 It's a beautifully composed dish of flavours and textures, the bed of creamed corn working so well with the chicken punctuated by the crunch of sprouted chickpeas and beans. The jus is remarkably flavoursome too. 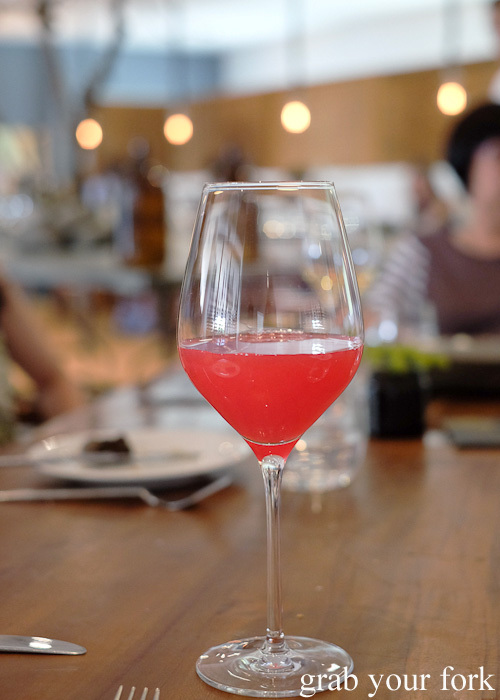 We laugh when our waiter describes the matching bruised pomme juice as "apples bashed with mallets". The juice sits for three days and is then lightly smoked. It's surprisingly complex, with a slight tingle from early fermentation. 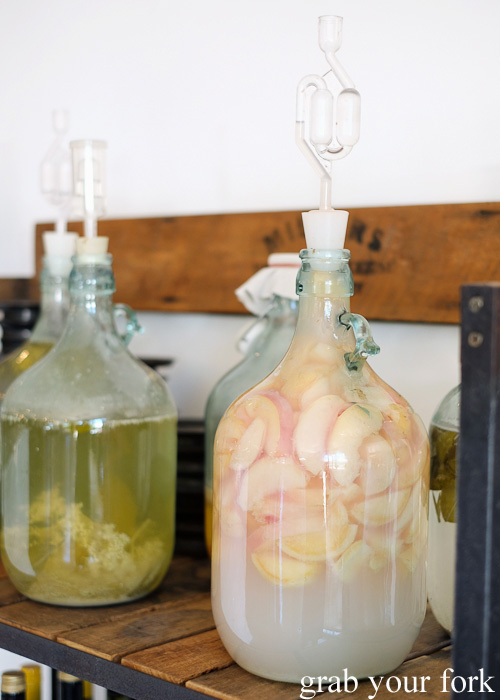 We admire an array of fermenting bottles in the bar next door, spying peaches, fennel flowers, elderflower and more. There are a couple of gaps in the pacing of our dishes, a lapse we attribute to catering for the wedding party next door, but service resumes promptly with the latter half of our menu. The soft leeks, dark rye and animal glaze causes most of us to double-take at the mention of animal glaze. It's another confronting thought that we presume is deliberate, a jumble of bones making a intense stock that adds depth to the log of soft-cooked leek coated in dark rye crumbs. The matched juice of beetroot, grape and native pepper is my favourite one of the flight. There's no lingering earthiness of beetroot, pulled back by just enough grape juice to diffuse without overwhelming the beetroot flavour. 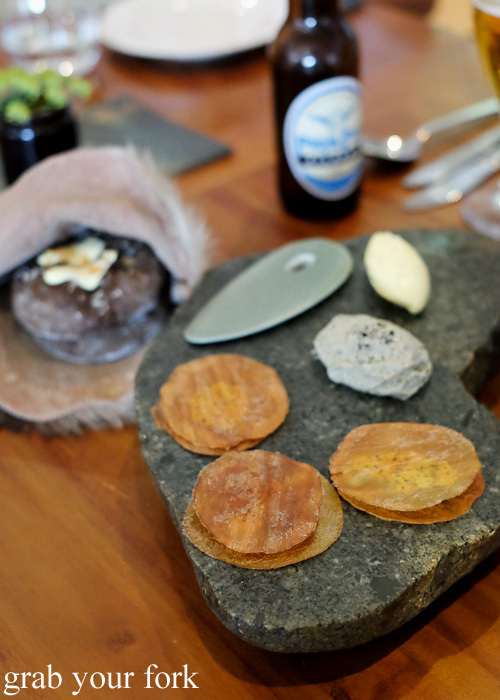 Our final savoury dish is the hogget, dried lactose and fresh oats. Hogget is a sheep between one and two years old, a brief stage between lamb and mutton. The narrow slab of hogget is tender with a thick layer of intense fat. It's a rich dish without any acidic relief. A bed of fresh oats has an elegant porridge-like consistency. The curls of dried lactose are made by lowering the heat lamps in the kitchen over trays of milk until dehydrated. 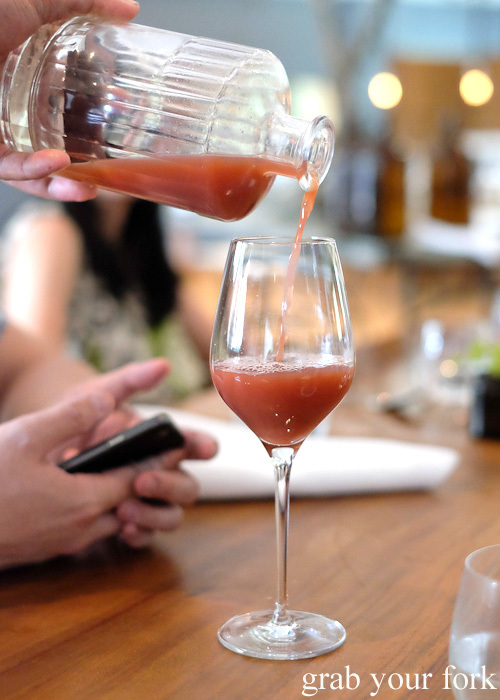 The matching juice is simply described as Sustainability, a catch-all of leftovers - plum skins, grapefruit and oranges are mentioned - that are combined in a well-balanced cocktail of fruits. Desserts are a three-stage affair. 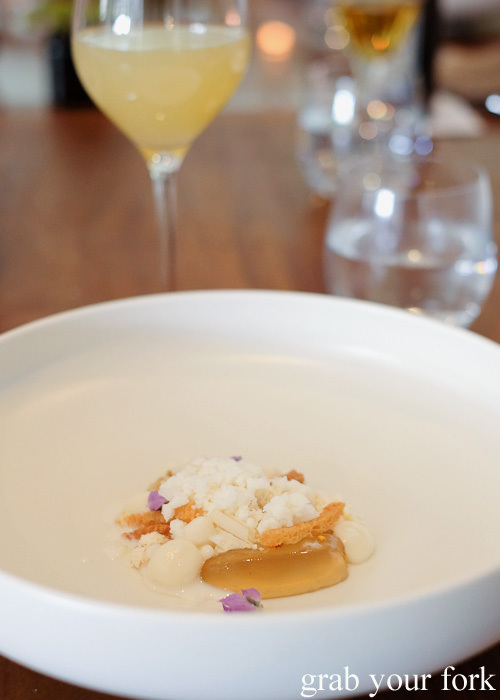 The honey, brioche, frozen milk and macadamia has an angelic beauty to it. There's a noticeable hit from the wild honey, tempered by shavings of frozen milk, wobbles of jelly and crunchy twigs of toasted brioche. It's a welcome palate cleanser. 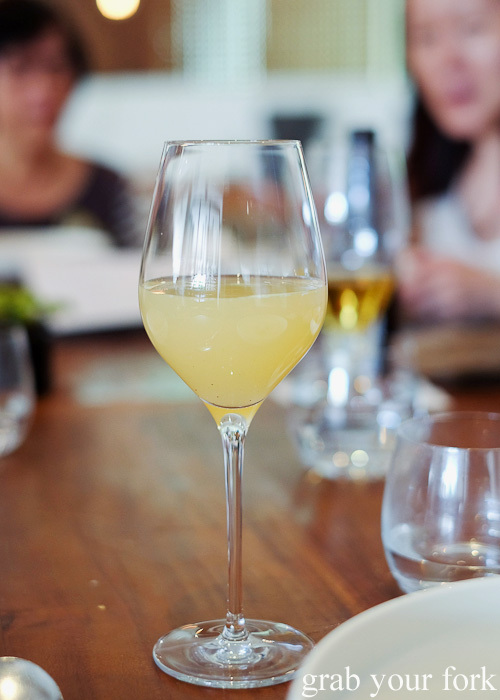 The pressed apple juice is a fine match for dessert, lifted with notes of lavender and balanced with agave for a gentle sweetness. 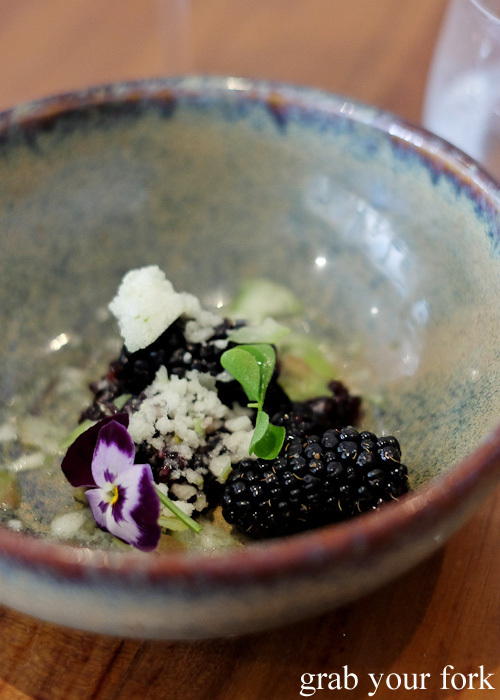 is a keen fan of foraging, incorporating apples grown by the road into a dish that features fresh blackberries and a dense blackberry jam that is almost chewy in consistency. 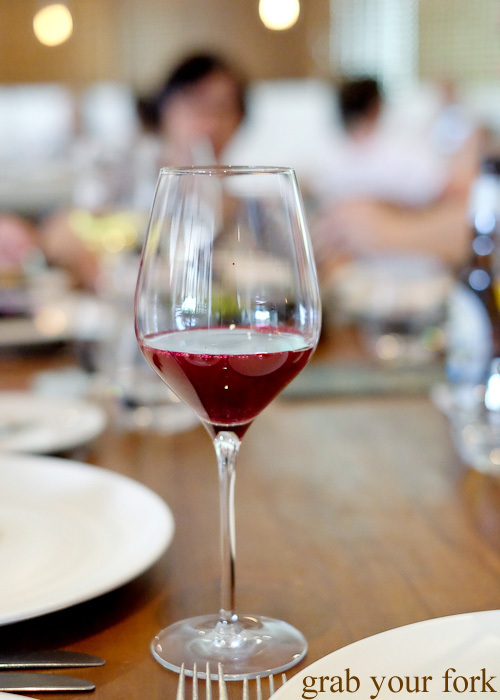 We'd been impressed by the consideration and thought behind the juice pairings and the final offering is equally good. 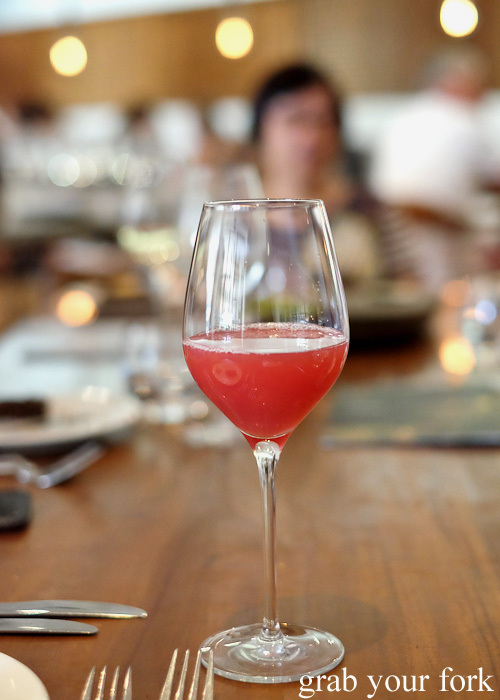 The pressed grapes with juniper berry and cinnamon is said to be Biota's take on a non-alcoholic vermouth. It's a complex flavour combination that sits well with the blackberry dessert. 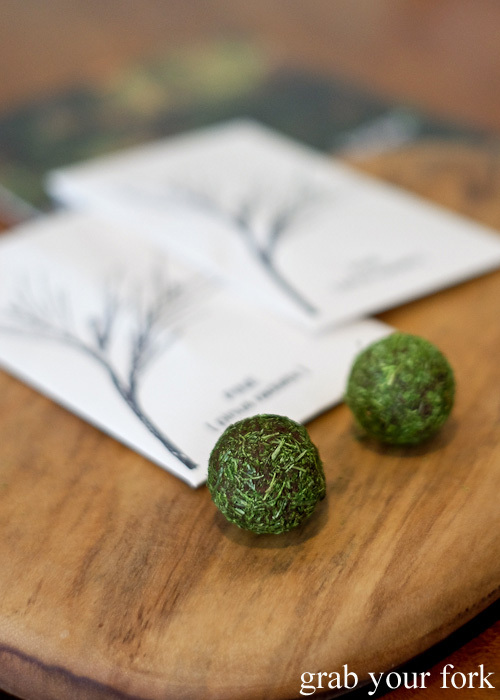 Little envelopes of petit fours salted pine caramels can be enjoyed on the spot with tea or coffee, or taken home as a gift. It's hard not to confuse the pine needle coating with grass clipping as you eat them, but the use of local flora is a commendable one. We don't get much of a sense of pine aroma or flavour but the caramel filling is thick and oozing. 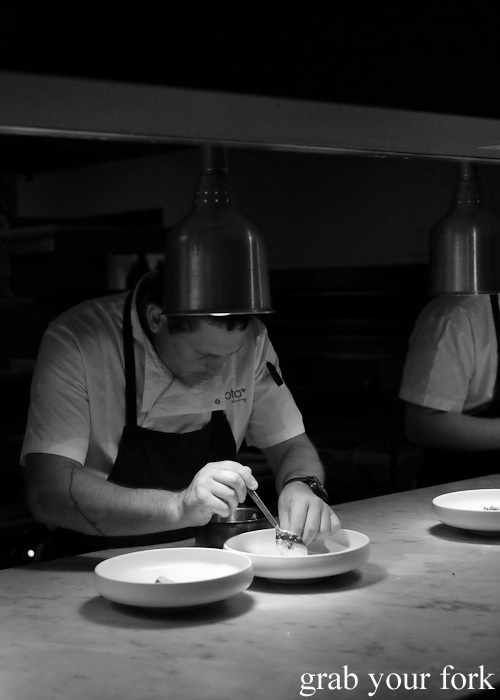 The open kitchen means there's a clear view of all the action on the pass too. 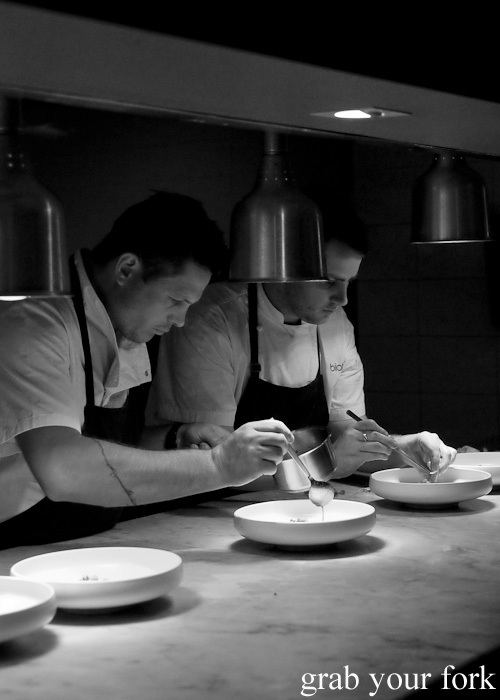 There's a serene sense of focus as each dish is plated along the line. It's mesmerising to watch; an oasis of calm before we head back to the hustle bustle of the big smoke. What an extravagant meal! 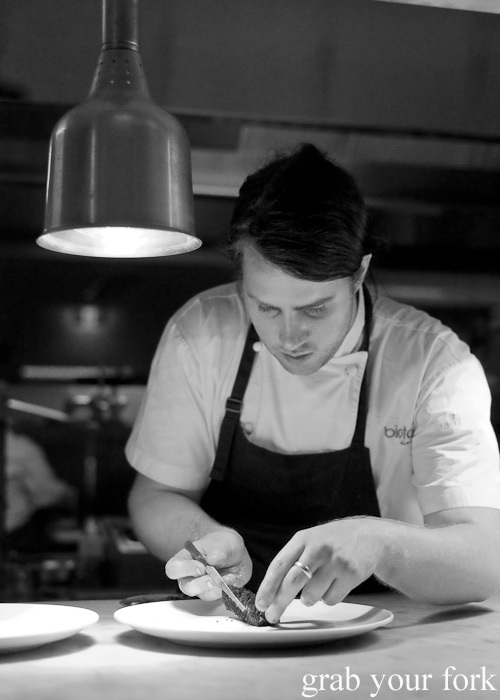 And love the shots of all the tweezer action in the kitchen. WOW what an extensive and delicious sounding menu. 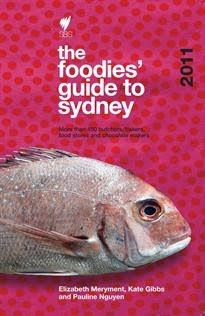 I've always wanted to go to Biota. Thanks for sharing the experience and so beautifully written as always! 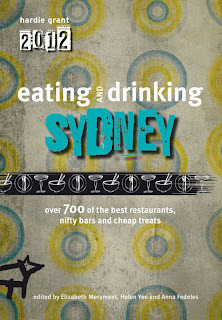 I read about Biota in Delicious magazine and fell in love or so I thought. 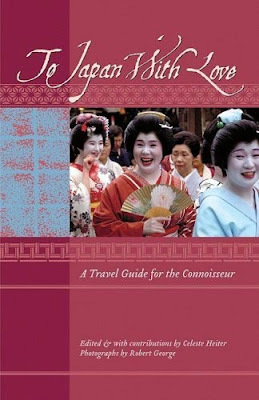 After reading your review I think I was only in lust before. Definitely love now. What an amazing dining experience! You've taken such beautiful pictures too! Love the little salted pine caramels, and the matching juices look so cool! 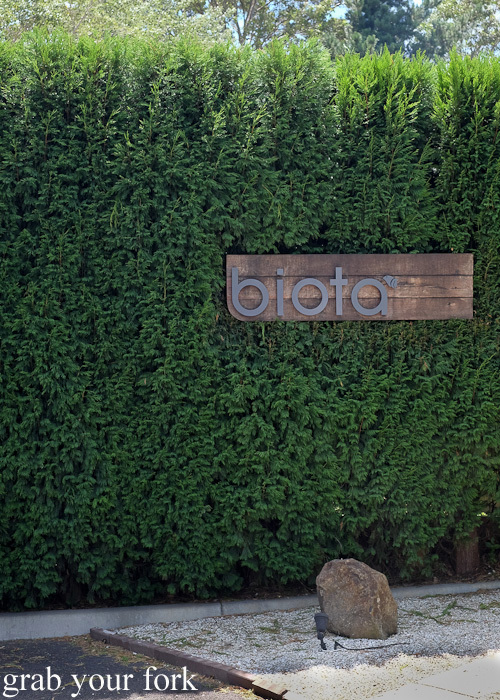 I did enjoy my one time at Biota Dining and you're right! Being at Bowral feels like a million miles from Sydney. The surrounding gardens were so relaxing. Bong Bong Street? How cute- I'm definitely going to 'grab my fork" for this place! What an amazing looking place, everything is stunning I can see why it is so well acclaimed. And such stunning photos too Helen! Every dish here looks like a piece of art and the juice sounds amazing! ** Screech!! 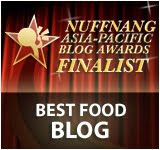 ** OMG this is one of my FAVE restaurants!! I LOVE it for ambience, that it's a drive but not TOO far from Sydney and the food and the garden - love love LOVE everything about it! Honestly it is one of my best dining memories from 2014. 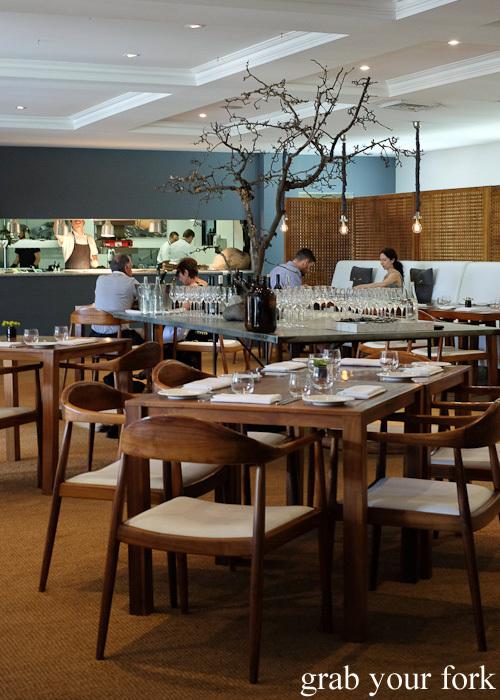 Having been to Biota not too long ago, it's stunning to see how much the menu has changed. Looks like they're still innovating at teeth's edge, while keeping in harmony with the biota of the Southern Highlands. Excellent! 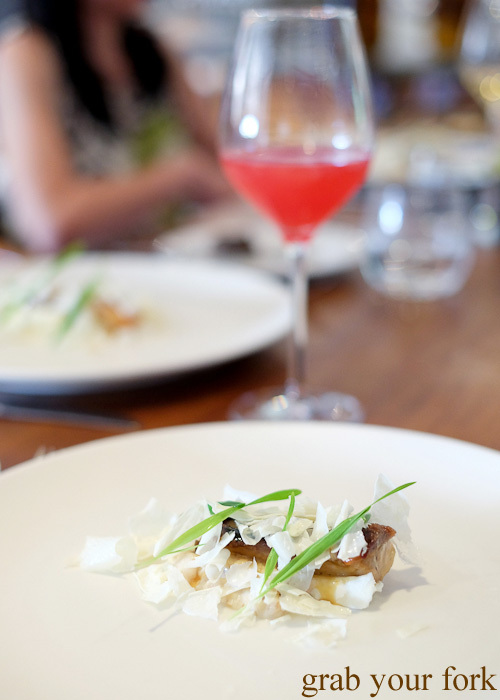 Such beautiful dishes and the juice pairings look and sound good too. Oh mercy! 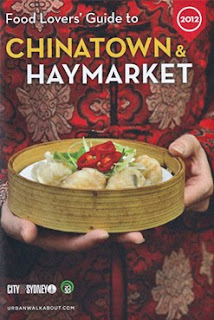 When I was still in Canada, my mum mentioned dining here and said we'd have to go back when I returned. I need to start reminding her of that promise on the regular! 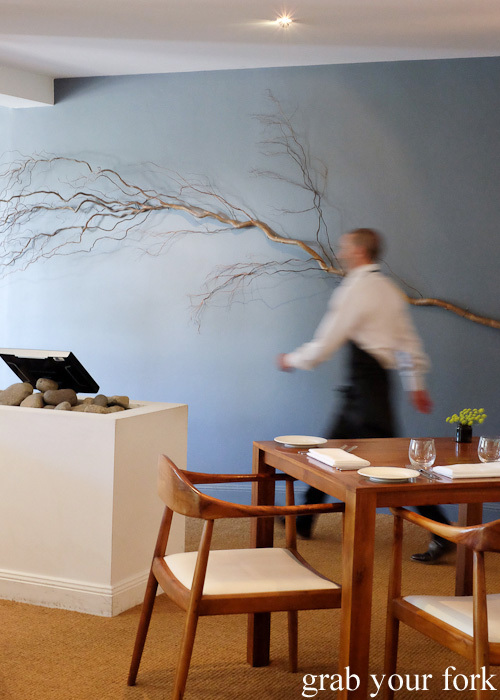 Have been to Biota main dining room once, nearly two years ago, and loved it. We particularly enjoyed watching the pass as our table was near it, and there was just the two of us. Since then we've dined a couple of times in the bar area when we've been passing through. Luckily we haven't struck a wedding so have been able to walk in. We've thoroughly enjoyed that too - though not so much being chased by the geese in the kitchen garden. (They weren't there the last time we went). All in all, a wonderful and very interesting place. Still wanting to get here, damn my long list! Looks absolutely wonderful! Lucky you. Planning to get there eventually! 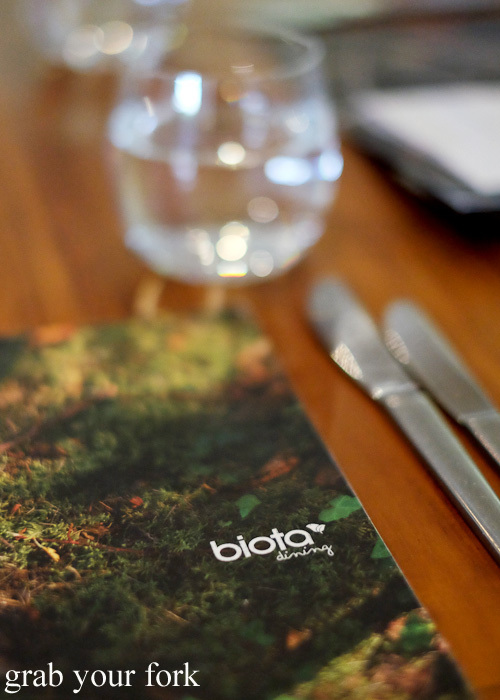 I'm really keen to try Biota - that sense of local food, slow food, is really appealing. 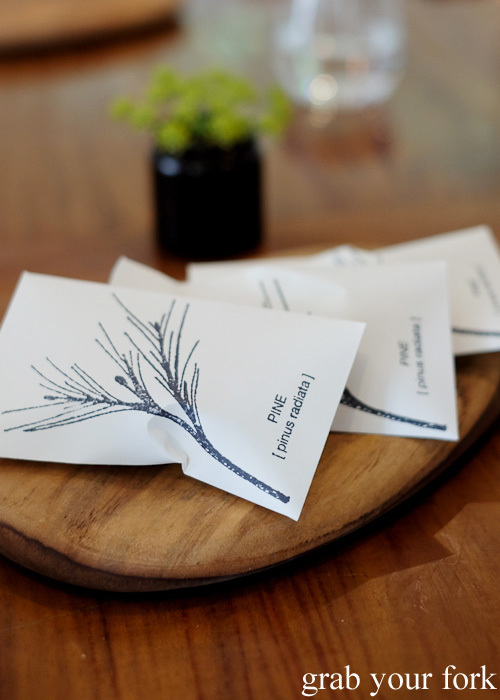 Luckily, the husband is turning 30 soon and we're going to do a weekend away down the coast, so maybe we'll make a reservation at Biota as a special treat!